Brookfield Craft Center’s 43rd Annual Holiday Sale features an extraordinary collection of contemporary American craft for the holidays: handmade works by more than 150 selected artists in jewelry, wearable fiber, ceramics, toys, glass, wood, paper and steel. All purchases benefit the Craft Center’s education programs, and provide support for independent artists. Come to the Opening Reception Friday November 9 from 5-8pm. Take part the treasured tradition of giving handmade in the United States gifts for the holidays. Find one-of-a-kind hand crafted gifts — from holiday ornaments to woodcrafts, beautiful fused glass and jewelry to pottery, fiber works, and so much more. We have beautiful one-of-a-kind gifts! 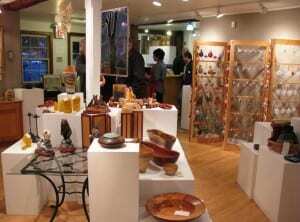 We invite you to visit the Brookfield Craft Center Gift Shop Gallery. You may also visit us by appointment, please give us a call at 203-775-4526. Buster Shaw, former instructor, board member and long time friend of the Brookfield Craft Center has endowed a scholarship in Woodturning at the BCC. The scholarship is awarded on a quarterly basis and will cover tuition and all materials fees for an entry-level woodturning class. Click here for more information or to download the application today. Please note, no Jewelry Open Studio today. Please be advised all classes are canceled today.